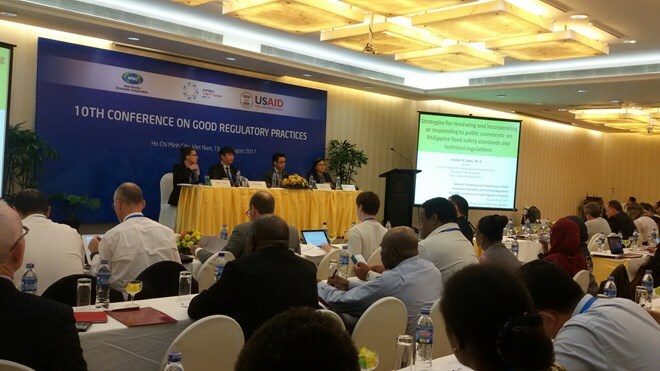 HCM City (VNA) – The APEC Sub-Committee on Standards and Conformance convened its tenth Conference on Good Regulatory Practices (GRP) in Ho Chi Minh City on August 19-20. The event brought together more than 100 representatives of both member and non-member economies of the Asia Pacific Economic Cooperation (APEC), along with experts from the Organisation for Economic Cooperation and Development (OECD), the Economic Committee, the International Organisation for Standardisation (ISO) and the Asian Development Bank (ADB), among others. The delegates reviewed progresses in GRP made by APEC economies and discussed major issues mentioned in the Renewed APEC Agenda for Structural Reform. They talked about processing and consideration of public comments in standards and technical regulations, trends and practices in regulatory impact analysis, and international coordination in rulemaking activities. They also shared good practices in fulfilling tasks set for members of the World Trade Organisation (WTO). The SCSC was established in 1994 to help reduce the negative effects that differing standards and conformance arrangements have on trade and investment flows in the Asia-Pacific region. The SCSC also promotes open regionalism and market-driven economic interdependence by encouraging greater alignment of APEC member economies' standards with international standards.